Anonymous: Normally, you have several ko-threats at your disposal. The order in which they are played is important. Past discussions on the newsgroup seem to indicate that you should play a threat that is larger than the value of the ko, but that you should save your biggest threats for last. I.e. if the ko is worth 17 points, and you have threats of 18, 25 and 27 points value, play the 18 points first, then the 25 points etc. The reason for this is that later in the game, a bigger ko may come up which may require bigger threats. However, you should always play ko threats which are bigger than the ko. HolIgor: the last statement is not absolute. Get as much as you can if the ko fight cannot be avoided. Avoid ko fights if you can't gain by them. Threats so big that they must be answered are primary threats. Smaller threats that do not have to be answered but are costly to ignore are secondary threats. Even smaller threats that are not costly to ignore but prevent loss if ignored are tertiary threats. Sometimes miai pairs can function as tertiary threats. These are virtual threats. The komaster may answer secondary or tertiary threats if he has enough primary threats. In general, the komaster may play any primary threat. The koloser may play any threat at least as large as the largest threat that the komaster should ignore. KarlKnechtel: Could we see a diagram example of a tertiary threat? is worth 1 point, and its threat is also worth 1 point. It is an ambiguous play. Aside from winning the ko, a ko threat may have value by delaying the win. The point is that the opponent gets less in exchange for the ko because the size of other plays (ambient temperature) has dropped. A tertiary threat takes away that value because it keeps the temperature from dropping for one round. 2) Whether a ko threat is a double threat. Some primary ko threats are miai, and may be played by either player. In general, they should be played as soon as the ko fight begins, or in preparation for the fight, to prevent the opponent from playing them. KarlKnechtel: That doesn't make sense to me given my understanding of the term miai. I think I see what you're getting at though. Charles Matthews Here's a typical example. In this position Black has a ko threat at a which White is expected to answer by capturing at b. 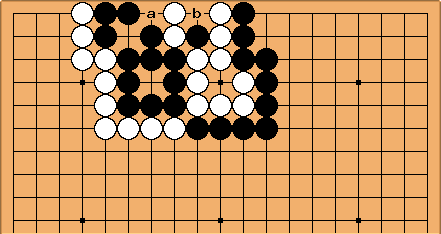 But equally White b is a ko threat, which Black is expected to answer at a. You wouldn't call a and b miai in a strict sense. Except for ko threats, though, first play here is unimportant. Bill: Actually, they are miai. One meaning of miai is that one player gets (or is expected to get) one play while the other gets the other, and it does not matter (or matters little) who gets which play. Another meaning is that one player gets one play while the other player gets the other, but you know who gets which play. Fair enough then. I think the miai page needs some editing in that case, though. The general principle is: remove double threats before you first capture the ko. 3) Whether a ko threat is a losing threat. Some primary ko threats are costly to play. In general they should be played as late as possible. 4) Size of the reverse sente of a threat. Other kos may exist on the board, or may arise later, or may threaten to arise. 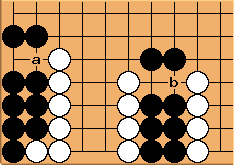 In general, ko threats with larger reverse sente should be played early, since they will disappear naturally earlier in the play if they remain after the ko is decided than threats with smaller reverse sente. 5) Stage of an approach ko or other hyperactive ko. With hyperactive kos one player, instead of winning the ko, may make a play that makes the ko hotter. (With an approach ko she may be forced to play an approach move before she can win the ko.) In general players should save their large threats for the later stages of such kos, after they have become hotter, and play their small threats early. This is not just psychologically correct, but technically correct (assuming that threat size is the deciding factor), because if your opponent ignores your threat, his local threats disappear or become smaller, while your large threats remain on the board. Retaining them may allow you to win a later ko or force your opponent to avoid one. As far as order of playing threats is concerned, local threats behave somewhat like threats of very high value (say 250). It isn't true that you ought to play high-value threats first. One of the reasons for that is that you prefer to save them for a later, more important ko. That reason is no good as applied to local threats - you could put it the other way round, that you prefer to finish all the local threats you have before the ko is over. There is another reason for delaying high-value threats, which is that they may be loss-making threats. Now this certainly may also apply to local threats. They can lose points, either for sure, or if you are anyway going to lose the ko and they make the loss worse. They may also be aji keshi, or throw away liberties or create cutting points, or just in some way have an adverse effect that has to be balanced against their possible gainful effect on the ko fight. I can certainly show an example from a pro game where one side delays using local threats until the final stages of a ko. I think you can explain that as a probing mechanism: you can be completely sure that local threats enable you to retake the ko. You have that information, you in some way want to test the opponent's approach to fighting the ko (for example, will she start using loss-making threats?). This seems to be a novel theme in analysis of ko fights: using local threats is a kind of forcing play, holding them back can allow you time to simplify some issues. Sorry if this seems complex ... ko just isn't that easy. His text says that if these are both primary threats then b should be played first, but that a is also good because it's worth a real point. Strictly, which should be played first and when? The issue here is what to do when a threat is actually worth some points, something not discussed above. Bill: Actually, I mentioned it under the value of the reverse sente. The reverse sente for b is 0, for a it is 1. I do not know if Simon was using my definition of primary threat, but, if so, then the opponent should answer both threats. If he does, the order does not matter. If not, it is better in general if he ignores a, both because it is bigger and because the reverse sente is bigger. This does not mean that there may not be circumstances where b is technically better (although nothing comes to mind right away). Of course, b may be psychologically better if it is more likely to induce an error. Imagist: It actually seems to me that the rule that you should always play threats bigger than the ko is phenomenally terrible advice. I recently won a game where a ko started early in the middlegame which was worth about 10 points. I had a two threats worth more than the ko, and my opponent had four, but I had five threats worth 8-9 points. Seeing that I couldn't win the ko, I played out two 9 point threats; my opponent responded to the first and used one of his larger ko threats, and then he ignored the second; he got ten points and I got 9. Later I won a much larger ko using one of the ko threats that I had since the middlegame. Bill: Besides, it is not clear what anonymous meant. He probably meant to use miai value, but did not make that clear. Imagist, what do your numbers mean? Do you mean that the difference between winning and losing the ko was 10 points? Do you mean that the difference between answering the threat and completing the threat was 9 points? If so, the threat was larger than the ko. Each play in the threat gained 4 1/2 points, while each play in the ko gained only 3 1/3 points. Tapir: Aside, mutual threats (play them first), local threats (play them second), the basic idea is to play primary threats the smallest first and secondary threats the largest first, if you think about playing tertiary threats you are desperate anyway. But what happens in Approach Kos, how to you play your threats there?